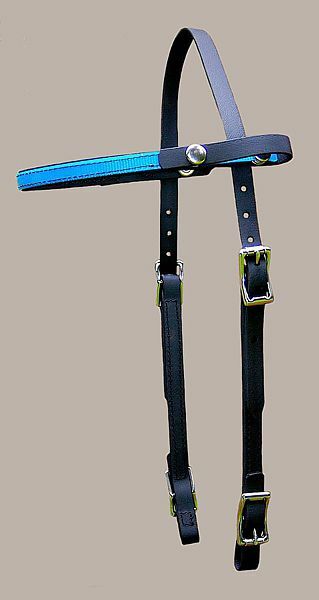 The headstall can be used with rope halters or a halter of your choice. 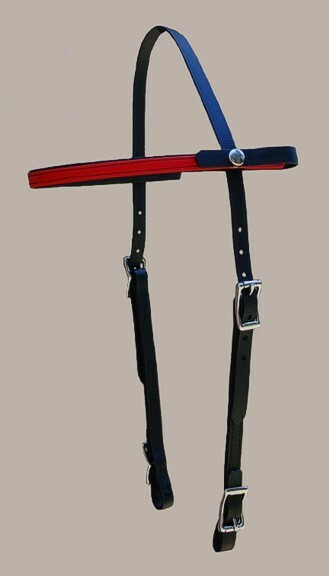 The headstall is 5/8" width and can be in brass or stainless steel hardware. Arab or Horse size. ADH-hsb - $123.50 - Horse Shoe Brand hardware. Pictured in red beta/black beta with stainless steel hardware. Double Snap Option: For horses that are too sensitive about their ears, making them difficult to bridle. It is design to be used with an Add-On halter or a rope halter. The interior snap keeps the crown of bridle in place and the outer snap keeps the halter in place. The double snap option is on each of the brow. 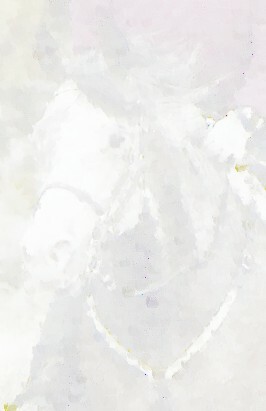 This allows the brow to be added after the headstall is on the horse. There is a separate link below if you wish to add this option. No shipping cost is added with this link. It cannot be ordered without the headstall. Pictured in turquoise biothane over black beta. Pictured in reflective biothane/black beta with brass hardware. ADH-hsb - $138.50 - Horse Shoe Brand hardware. 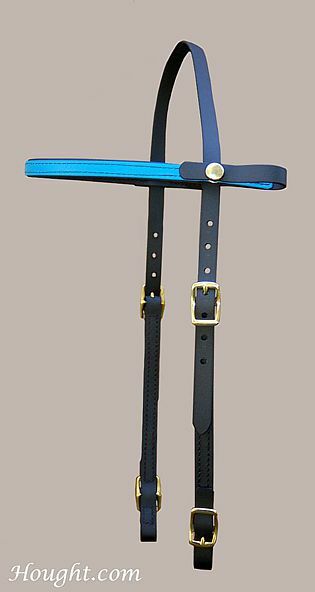 The headstall is 5/8" width and can be in brass, stainless steel or Horse Shoe Brand hardware. Arab or Horse size. Pictured in sky blue biothane/black beta with brass hardware. Below are a variety of Deluxe Add-On Headstalls without halters may be order online. Choose your choice of size, hardware and color. Deluxe Add-On Headstall - no halter - biothane overlay on brow. Choose your size, hardware and color. Deluxe Add-On Headstall - no halter - beta overlay on brow. Deluxe Add-On Headstall - no halter - reflective overlay on brow. Please contact us to order this option. Double Snap Options - see discription above. Other color combinations can be found here.